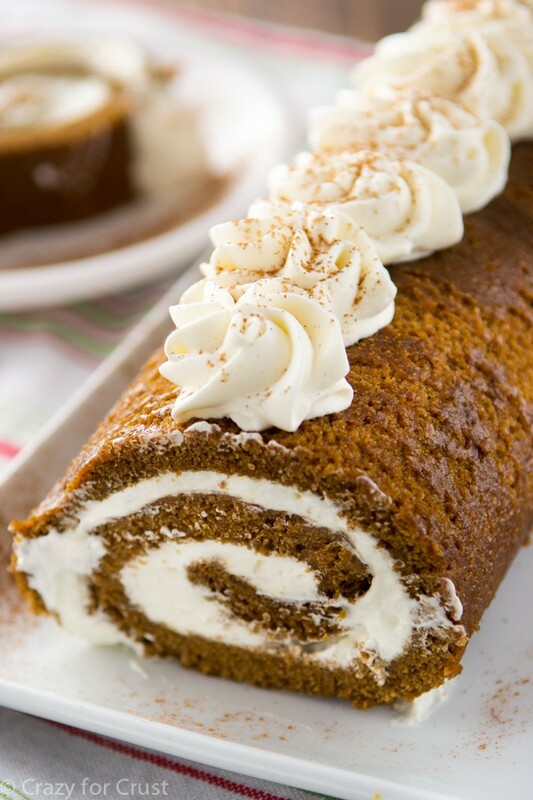 This Gingerbread Cake Roll is a blend of gingerbread and eggnog in one divine dessert for the holidays. ‘Tis the season for all things gingerbread and eggnog. I’ve killed three birds with one stone in this post: I’ve got both flavors covered in a holiday cake roll. This Gingerbread Cake Roll with Eggnog Whipped Cream was a hit with my family, and it will be with yours too! So you know how I blather on and on about how my husband never eats anything I make? Well, don’t hold your breath, he didn’t eat this one. No, I bring that up because today we’re talking about my mom. My mom eats everything I make. Well, she eats everything that I give her that I make. Since she lives 2 hours away, she doesn’t get everything…but she’s always hopefully that there is something in the freezer waiting for her. Sometimes, when I think about it, I put a couple cookies or a slice of pie in a baggie in the freezer, just for her. And then I usually eat it when I’m raiding the freezer during an I-Need-Sugar binge. But it’s the thought that counts, right? Okay, back to my mom. So, normally she’ll eat anything I make. But the two things she doesn’t like are gingerbread and eggnog. She’d help me make gingerbread men when I was a kid…but she’d never eat them. And she’d just make disgusting faces when my dad and I guzzled the eggnog. My parents were both big time “your tastes will change” and “you’ll like it when you’re older” people. And I have to give it to them…they were sort of right. I eat pork chops now. And I like spinach – but only raw. But I’ll never, ever eat mustard or white bratwurst, thankyouverymuch. My point? Tastes change as you get older. I’m going somewhere, I promise. The point is that my mom put aside her dislike of gingerbread and eggnog to try this cake roll at Thanksgiving. She’s doesn’t suffer from food neophobia (it’s a thing) like I do. And guess what? She LIKED this Gingerbread Cake Roll. And she even liked the Eggnog Whipped Cream! 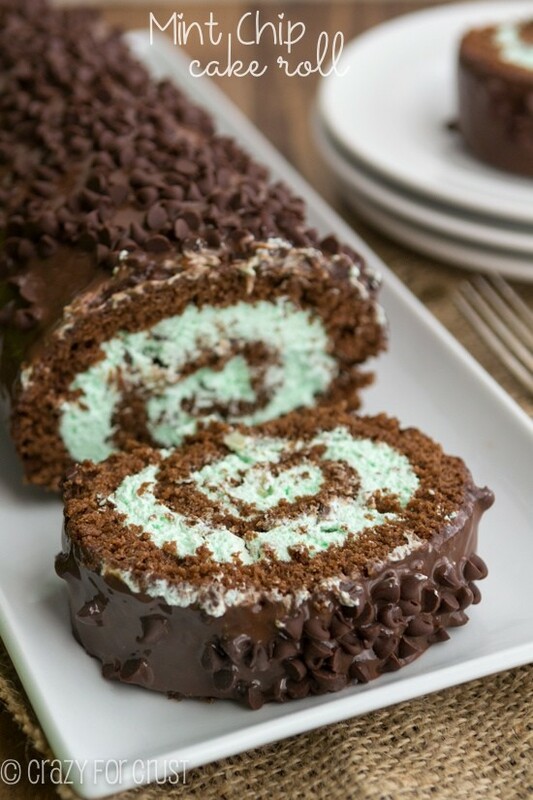 Pretty much my point is that even if you don’t like these essential Christmas ingredients, there is still a very good chance you’ll like this cake roll. Let’s break down this cake roll recipe, shall we? We’re old pros at cake rolls around here, right? Oh, you’re not? Okay then, go read my step-by-step photo tutorial of how to make a carrot cake roll and my tips and tricks for cake roll success in my zucchini cake roll recipe. The cake part of this roll is a gingerbread cake. It’s a similar recipe to the Spiced Apple Cake Roll, but with more spice and molasses. You bake the cake in a jelly roll pan (a 10×15 pan with 1″ sides). I always like to line my pan with foil and spray with the floured cooking spray for easy removal. I’ve been told you can also use parchment, but I’ve never tried it. I always bake my cakes at 350°F for about 10-11 minutes. A toothpick will come out clean. Err on the side of more done to less done but not so much it’s totally dried out. You roll the hot and just out of the oven cake up in a clean kitchen towel that’s been coated with powdered sugar. Then you let it cool completely. Note: because of all the molasses and the applesauce in this cake, it’s a moist one. The exterior of the cake is one that will transfer to your fingers. That’s okay, mine still rolled and unrolled just fine. When the cake is cool (about 2 hours or you can wait until the next day), you make your whipped cream. I infused my whipped cream with some low-fat eggnog. I added only a few tablespoons so it’s not too strong, but the eggnog flavor is there. 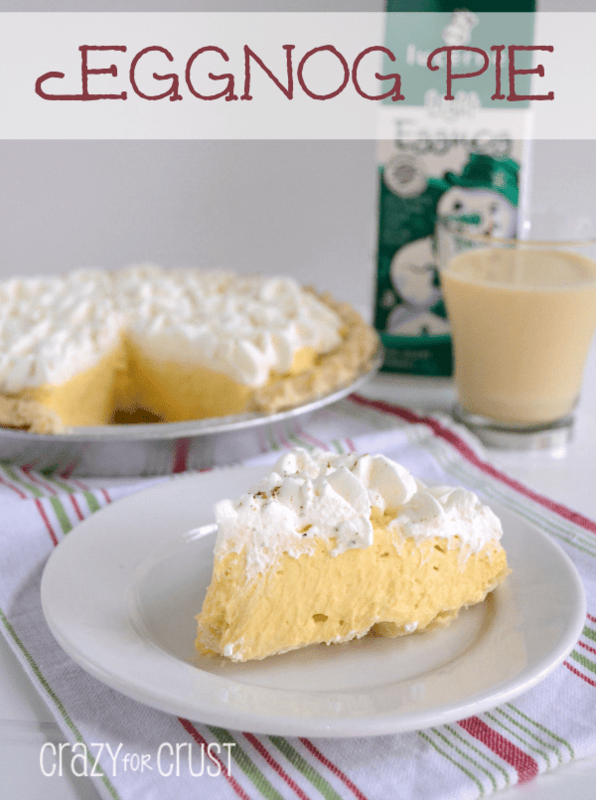 If you really don’t like eggnog, you could fill this cake with plain whipped cream or lemon whipped cream, or even ice cream. 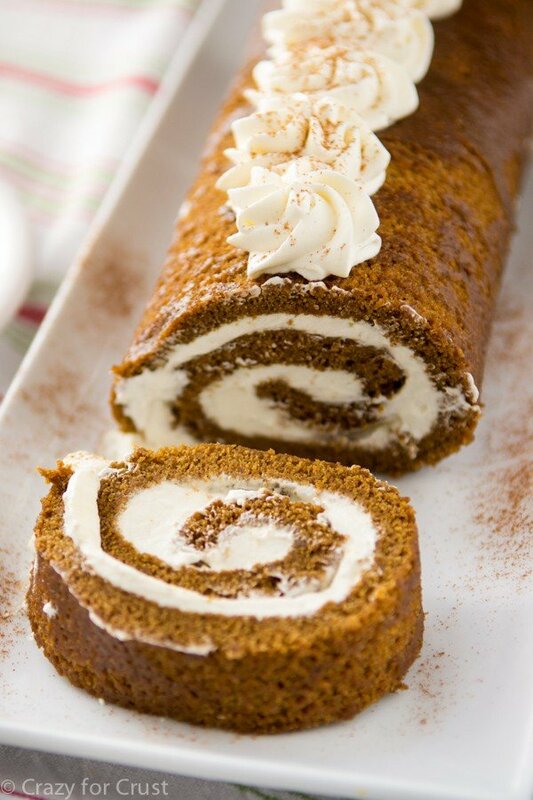 This Gingerbread Cake Roll has lots of Christmas flavor in a very subtle way. In other words, it’s the perfect cake roll! And my mom gave it two thumbs up. And when it comes to gingerbread and eggnog, two thumbs up from my mom is like a gold star from Mel. 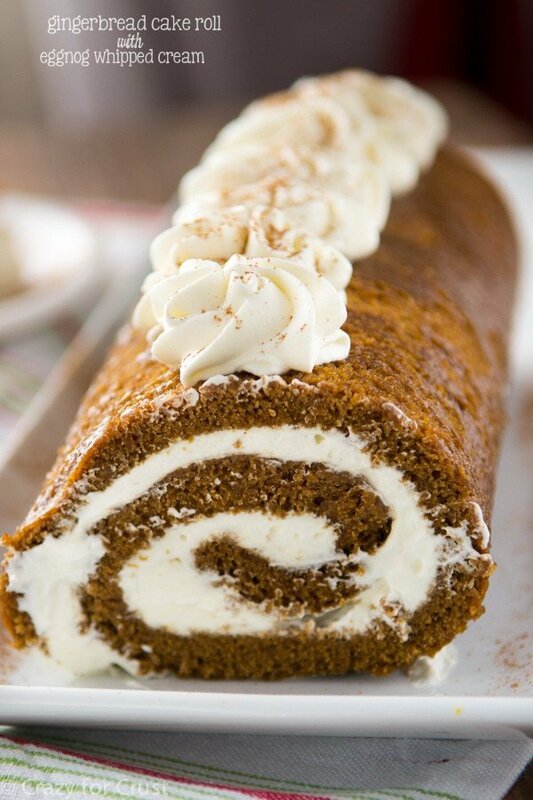 So, basically, you need to make this Gingerbread Cake Roll. 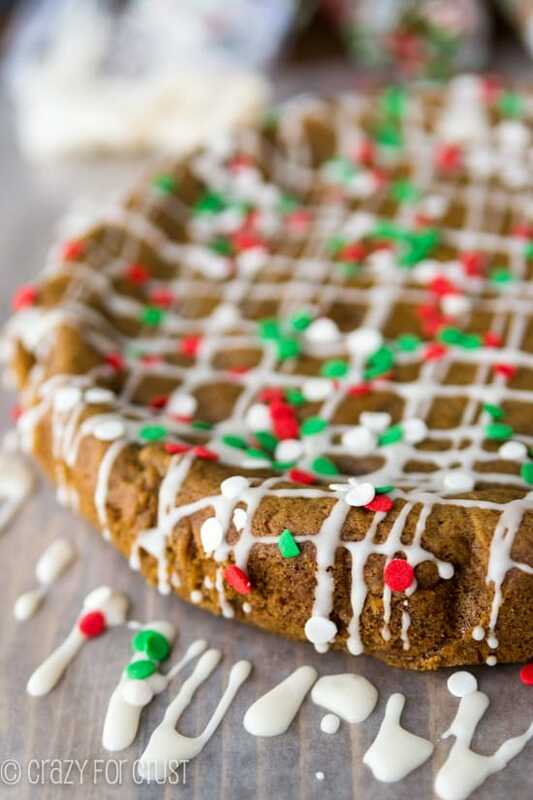 A soft gingerbread cake is filled with an eggnog whipped cream! 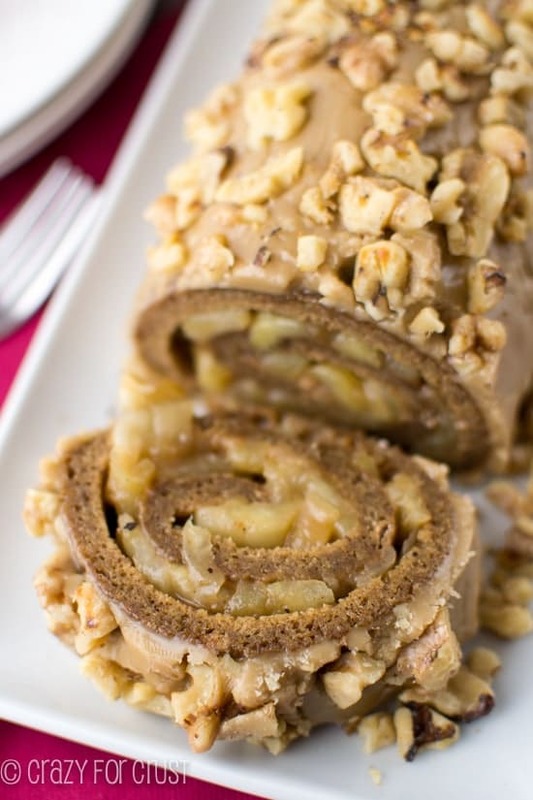 I can guarantee that even non-gingerbread and non-eggnog lovers will LOVE this cake roll. Line a 10x15 inch jelly roll pan with foil (for easy removal).Grease and flour the pan (I use the cooking spray that has flour in it for this step.) You can also line your pan with parchment paper instead of foil. Grease it just in case! Beat eggs at high speed for 5 minutes. Gradually beat in sugar, applesauce, and molasses. Stir together flour, baking powder, cinnamon, allspice, ginger, and salt. Add to other mixture. Spread into pan. Bake at 350°F for 10-12 minutes. Note: you want to make sure you cake is done. A toothpick should come out completely clean. Err on the side of overdone for cake rolls, that makes them roll easier. Turn out immediately onto a kitchen towel sprinkled liberally with powdered sugar. Starting at the narrow end, roll towel and cake together. Cool completely. Note: the cake is sticky, soft, and spongey. It might come off a little on your fingers, but that’s okay. Cooling will take at least 2 hours. You can make the cake a day ahead. Just wrap the cooled cake with plastic wrap overnight. Make the filling: Beat cold heavy whipping cream in a stand mixer with the whisk attachment (or in a large bowl with a hand mixer) until soft peaks form. (This takes about 2 minutes with my stand mixer on medium speed.) Add powdered sugar, and vanilla. Add eggnog 1 tablespoon at a time, slowly. Continue beating until stiff peaks form. Be careful not to overwhip. Once cake is cool, carefully unroll it. It might leave a little mess on the towel, but that’s okay, as long as you can peel it off. Spread about half the whipped cream over the top of the cake, leaving an edge at the end. Starting at the narrow end, re-roll the cake. As you roll it the filling will shift a little and you may need to remove some if you’ve put too much on the cake. That’s okay, just have a knife handy to scrape off any excess as you roll. At this point you can wrap the cake in plastic wrap and refrigerate for up to 24 hours. When ready, place cake on serving plate and top with some of the remaining whipped cream and dust with cinnamon. Check out ALL of my CAKE ROLL recipes here! Too funny – I save a ton of stuff for my mom and freeze it. I call her freezer full of my frozen recipes the “cake graveyard” and the name has caught on. 🙂 I’m in love with this cake roll – both gingerbread and eggnog in one – sign me up! I can imagine with all those cakes you make!! If you can make an eggnog and gingerbread cake roll that your mom would like, I don’t even want to think about the damage of a full blown eggnog lover like me could do to this gorgeous dessert. Pinning! How do you get your eggnog whipped cream so stiff? As soon as I add the eggnog to my soft peaks, it kills the whip and I end up with runny, delicious eggnog goo. Try adding the eggnog a little at a time instead of all at once. That might help! This recipe turned out awful. I did exactly as written and I couldn’t get the blasted thing off the towel. It also had cracked up at least ten times across the cake because it was too thin. It was incredibly sticky! So much that my mom suggested turning the horrible mess of crumbled stickiness into cake pops and dipping them in chocolate. Your pictures are lovely and I like the idea but I have no idea why it turned into such a nightmare for me. I’m sorry that happened Aubrey! Mine was sticky as well, but it came off of the towel fine. Possibly it needed to bake longer. It seems wrong, but cake rolls need to be slightly overdone so they roll okay. (The wetter, or more underdone, they are, the harder they are to roll.) So next time you try a cake roll, try to bake it an extra few minutes. And good save – cake balls or trifle would be great! What could I substitute for the applesauce? My mother is allergic to apples, but I’d like to make this. It looks amazing..
You can probably substitute vegetable oil. I haven’t tried it, but I used the applesauce in place of the oil. I would say 2 tablespoons oil, then if it seems to thick before spreading it (should look like a cake batter) add another tablespoon. Let me know if it works! I missed this one last year, and I have to say it’s a beaut!!! It’s been stalking me on Pinterest, and I just had to come tell you! WANT! I just made this cake for Christmas Eve dinner and it was a hit! Great recipe. I cannot wait to make this for our family at Christmas. I look at recipes all the time and very few do I ever make because they don’t entice my very much. I love cake rolls and it’s been a little since I’ve made a Buche de Noel so I’m going straight for you Gingerbread Eggnog delectable. All of my family loves these flavors, so I know it’s going to be a hit. Thanks for posting. I just saw all my typos. Sorry. 🙁 Small font gets me every time. I made this for Christmas dinner. It was a big hit and really tasted like Christmas. A very intense Gingerbread man flavor for the cake and very subtle eggnog cream filling. I meant to add a splash of rum to the cream but frankly, I just forgot. I think it would have been quite delicious and given the cream a little more character to stand up against the intensity of the gingerbread. I also bumped up the flour by two tablespoons and the sugar by a tablespoon, because the batter was really thin and quite bitter. I’m sure it was the size of my eggs – perhaps they were a bit larger – and maybe the brand of molasses I used was stronger (?) I garnished the cream on top with raspberries dusted with a little powdered sugar and tiny mint leaves, and put blackberries and raspberries all around the base on the larger mint leaves. Beautiful and delicious. The berries and mint were a lovely complimentary, fresh flavor with the gingerbread and cream and so pretty. Definitely something I would make again – very quick and easy and the end result was very impressive – looked and tasted fabulous. This turned out surprisingly well (I had never made a cake roll and was super afraid it would fall apart). I can’t tell if I overcooked my cake, or if it is the nature of gingerbread, but mine was kind of dense/not very moist – the gingerbread flavor was solid though. The eggnog whipped cream was also fantastic. Overall, great instructions, and good recipe. Just based on personal preference I would likely fill my cake roll with a frosting rather than a whipped cream next time. Thank you for this! I plan on using the filling to cover my cheesecake tomorrow! It’s an eggnog cheesecake. The top of my oven scraped my cheesecake so I’m using the filling to cover it ? This was delicious and so easy! I substituted vegetable oil for the apple sauce because I didn’t have apple sauce handy – it worked perfectly! Thank you!